*British star actor Chiwtel Ejifor’s directorial debut, ‘The Boy who harnessed the wind’ has its world premiere here. FOR A SHORT TIME the glitz and glamour of Sundance Film Festival will be focused on Luton – thanks to director Gurinder Chadha. 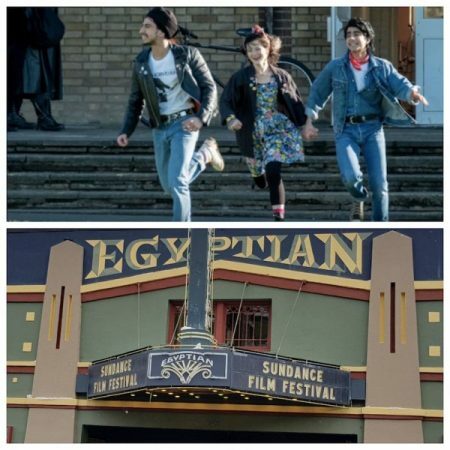 Her new film, ‘Blinded by the Light’ has its world premiere at the Sundance Film Festival, which begins today (January 24) and it’s one of a handful of films www.asianculturevulture.com is set to cover from Park City itself. Chadha, writer Sarfraz Mansoor – on whose popular memoir, ‘Greetings from Bury Park’ (about his childhood in the Luton suburb and his fascination with US rock legend Bruce Springsteen) and on which the film is based – and Viveik Kalra, who plays Safraz in the film, are all set to be in Park City. The film has its first screening on Sunday evening (January 27), starting at 1.30am UK time (6.30pm here). Tomorrow (January 25) sees ‘Late Night’ also opens in the world premieres section. Emma Thompson stars as a well-established late night TV talk show host whose world is rather turned on its axis when she brings her first woman writer – Kaling – into the preserve of her all-male writing team. Kaling as ‘Molly’ wants to be more than just the diversity token writer and the film explores white privilege, entitlement and a culture that is both conservative and superficial at certain times. Well-established American director Nisha Ganatra helms a film which unquestioningly has things to say to us all – but no doubt in Kaling’s inimitable and arresting way. Ritesh Batra returns to India and romance with ‘Photograph’ after directing the Julian Barnes’ film adaptation,‘The Sense of an Ending’. Nawazuddin Siddiqui (‘Manto’) and Sanya Malhotra (‘Dangal’) are the unlikely coupling – in more ways than one. Its first screening is on Sunday (January 27). It’s an Amazon Studio production. Richie Mehta, now based in London, but of Canadian-Indian heritage, premieres his first foray into a TV series. ‘Delhi crime story’ premieres in the Indie Episodic strand with the first two parts showing at Sundance on Tuesday (January 29). Shola Amoo, the writer-director of ‘The Last Tree’ returns to Sundance following his success with short, ‘Dear Mr Shakespeare’ (2017). His principle character, ‘Femi’ (Sam Adewunmi) enjoys a happy existence in Lincolnshire with his foster mum, but the tranquility and calm of his existence there is ruptured when his biological mother reclaims him and urges him back to London. Chiwetel Ejifor’s feature is about a young boy in Malawi who comes to the rescue of a community when it is threatened by a severe drought and an ensuing famine. By dipping into books in his local library, after he can longer continue his schooling due to financial constraints, he finds a way of harassing power when he comes across American textbook about energy. Adapted from a memoir, Ejifor said many of themes from the memoir resonated with him and drove him to make his first feature. It has its world premiere on Saturday (January 26) in Salt Lake City, a short distance from Park City, before playing in Park City from Monday (January 28) to Saturday after next (Febraury 2). Follow us in real time as we report from the festival, starting at 1pm (UK 8pm) with the Sundance Film Festival press conference. Facebook; Twitter; Instagram. You can hear many of the above filmmakers above talking about the films ahead of Sundance on the Sundance Institute’s Youtube channel.